The violent crackdown of the Saffron Revolution in September 2007 has added a deep notch in the scale of atrocities of the Burmese military rulers. It is true that the Saffron Revolution could not remove the regime from the power, but it has so badly wounded the regime that they will never be able to heal the scar. 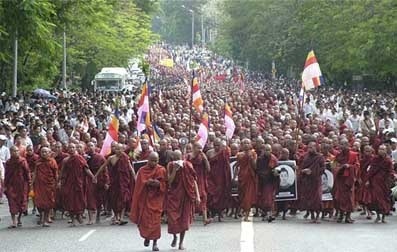 Earlier, people witnessed the brutalities of the military regime mostly on the unarmed civilians, but the crackdown of the Saffron Revolution has demonstrated to the people how brutally they can kill, torture and suppress the monks whom the people of Burma hold in the highest regards and reverence. It has seriously attacked the senses of the common people and caused a permanent disgust among them against the regime. Every year September will come to remind them the scale of brutalities of the military regime on the monks. The brutal oppression of the regime and the bloods of the monks spilled in the streets has opened the eyes of the people to see the true identity of the regime and woke them up once again from psychological derailment tactics of the junta. The immediate cause of the Saffron Revolution was mainly the sudden removal of the fuel subsidies. On August 15, 2007 the government removed subsidies on fuel causing a rapid and unannounced increase in prices. The government, which has a monopoly on fuel sales and is sold only by a state-owned fuel company – Myanmar Oil and Gas Enterprise, raised prices from about $1.40 to $2.80 a gallon, and boosted the price of natural gas by about 500%. This increase in fuel prices led to an increase in food prices and brought a disastrous situation for the common people in maintaining their livelihoods. The price of rice had jumped 10 percent, meat 15 percent, and a standard plate of noodles at a food stall had tripled. By the end of September, the price of a kilogram of rice had increased from around 300 kyat to 500 kyat, while a dozen eggs had doubled in price from 600 kyat to 1,200 kyat. People could no longer afford to buy rice and started to eat rice soup. And those who could not even afford to eat rice soup, they just started to eat corn. The United Nations ranked Burma among the 20 poorest countries of the world and for the economic distress of the country, many including the UN blamed the military regime and the proportion of national income spent on the armed forces. In late 2006, the cost of basic commodities began rising sharply in Burma with rice, eggs, and cooking oil increasing by 30-40%. According to the UN, one in three children is chronically malnourished, government spending on health and education is among the lowest anywhere in the world, and the average income is below $300 a year. Amidst this precarious condition of the common people, the luxurious life style of the army personnel came up as one of the most talked about issues of the country. It was a stunning show of defiance against the military regime and it was the largest anti-government protest in twenty years since 1988. In many places the columns of the protesting monks stretched up to 1 kilometer where the civilians – men and women were seen marching the streets forming a human shield around the monks keeping the monks in the middle and the ordinary people either side as if they were ready to receive the shower of bullets first before it can hit the revered monks. The government moved to silence the protest through all brutal means. Thousands of troops converged on foot and trucks in different areas of Rangoon , Mandalay , Sittwe etc to crack down on the demonstration. According to UN estimates, more than 3,000 protesters were arrested and at least 31 people were killed in the crackdown. Monasteries became the target of the daily raid of the army. They imprisoned many highly respected senior monks as the instigator of the protest. Many of the imprisoned monks were high ranking abbots of monasteries who spent even 30 to 40 years in teaching the Buddha Śãsana - the teachings of the Buddha. In the prisons, their robes were taken off and were forced to wear prison uniforms. In fact, for a monk it is the most painful event of life to take off his robes that he has worn to dedicate his life on the path of Buddha. It is true that the junta could take off their robes, but they could not strip of their spiritual monkhood. Despite being forced to wear prison uniforms and being officially stripped of their membership of the Sangha, they continued to practice their faith and meditation. There were many monks who have been sent to the prison labor camps to be chained and shackled from where the chances of return are very low because of malaria like that of the Devil's Island. Mentionably, it is the concrete floors where the prisoners have to lie without any beds where the gusty winds pass through. The food that they are given to eat are so bad that a pig would shake his head and refuse to eat when he sees that coming – even though pigs are known to have the habit of eating anything. Monks are the Dharma sons of Buddha. They pass their life beneath the veneer of serenity and religious devotion. They live quietly in monasteries studying Dhamma. They keep teaching the tenets of Buddha for the peace of the whole mankind of the world. The fundamental goal of Buddhism is peace. It teaches that peace or war is our decision and it is not out of our hands. The Buddha taught that the first step on the path to peace is understanding the causality of peace and to direct the efforts to remove the causes which hinder the peace just like removing a boiling water pot from fire to make it cool. If we do not first address the fundamental issues, all other actions will come to naught. Burma is a nation of 57.6 million people with a land area of 678,500 sq.km. Around 90 percent of the population are Buddhist and the rest are Muslims, Christians, Hindus or animists. There are 500,000 Buddhist monks, novices and nuns in Burma . Monkhood is the highest moral authority in Burma . In line with the Buddhist philosophy of removal from earthly desire, everything a monk owns or consumes is supposed to be donated by the lay community. Every morning the monks go out to collect alms with bowl – mostly food – from near their monasteries and people struggle to give them enough food to eat in lean times and in return the monks bestow on the donor the "merit" that will eventually help him or her achieve nirvana – or release from the cycle of birth. However, the monks are supposed to stay out of the temporal affairs such as politics. But when they see people suffering, they come forward to remove the causes which effect the sufferings as per the doctrine of Karma. According to the Vinaya- Buddhist rules for the monastic community, the only way a monk should get involved in political matters is if the government starts hurting people or suppress the monkhood. In 1919, there was a violence in Mandalay when the monks tried to expel a group of shoe-wearing British officials from a pagoda and they started a campaign against the British rule which has originated from this event of refusing of the British officials to remove their footwear while entering the temples which was a sign of a grave disrespect to the Buddhist holy sites and the campaign is known as "Shoe Question". Similarly, in 1889, Bo Ottama, a rebel monk who led 3,000 rebels in the Salin area a year after the invasion of Mandalay was captured and hanged by the British in 1889. Another martyr, Saya San, who was an ex-monk, led a peasant uprising in Tharrawaddy opposing the tax system imposed by the British. Burma 's colonial masters sent 10,000 troops to quell the rebellion, capturing Saya San and sending him, too, to the gallows. One of Burma 's independence heroes is U Wisara who was a highly respected senior monk. He was imprisoned several times for his public speech against British colonial rule and died in jail in 1929 after 166 days of hunger strike. And similarly another independence hero U Ottama was a highly respected monk from Arakan State who spent many years in prison for opposing British colonialism. In fact, in the history of Independent Burma it is the democratic government of U Nu who has sincerely shown highest respect to the monks and in 1961 U Nu also tried to legalize Buddhism as the state religion of Burma . But soon after the military takeover in 1962, General Ne Win regarded the monks as a potential opposition and schemed a strategy to control them. He subjected many senior monks who refused to cooperate with the regime to derogatory treatment like Mahasi Sayadaw who was Burma 's top Buddhist scholar and an internationally respected monk. Of course, Ne Win did not pretend to be a devout Buddhist and unlike the current military generals he was rarely seen in the religious ceremonies and with the monks. However, crushing the Saffron Revolution, the military regime has drawn themselves in the midst of a fierce struggle involving blood and fire, a life and death struggle with the monastic society of Burma and it will let them understand how deep, how arduous, how complex and how long-term the nature of the struggle is. The military regime has blocked all the avenues of peaceful protests of the common people and finally they have turned to the monastic community to take up the leadership for the cause of restoration of peace and democracy in the country. September will remain forever as a month of paying tribute to the souls of the monks and everyone else murdered openly in the streets or in the darkness of nights. The ideals of courage in the face of military brutalities and their readiness to sacrifice themselves on the altar of peace for the helpless commoners will be remembered by the people of Burma generations after generations with deep respect and also with deep sadness.The glory of the memorial structures which have been constructed in the hearts of the people will never fade. It will continue to shine forever and will inspire them to rise again and again to tear the shackles of tyranny and hoist the flag of peace for the distressed humanity.